When you want to order a deep-fried, battered potato snack in Australia, what name do you prefer to use? 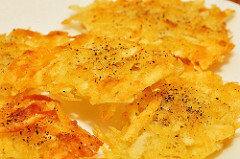 There’s “potato cake”, “potato scallop”, “potato fritter”, “hashbrown”, and others. Aussies interested in sharing the names you use to label your environment, should check out the “Linguistics Roadshow”, a website devoted to mapping dialectal differences found in the words used around Australia.